SofasAndSectionals.com has added so many products over the last year that they found it necessary to add some new search tools to help customers find the seating options that fit their needs. There are a number of criteria that shoppers can use to eliminate products that don’t include the features they require. SofasAndSectionals.com has a newly designed homepage to help customers better find the perfect piece of living room furniture. We have been adding so many products to our site that we felt that we needed to make it easier for shoppers to weed out the products that didn’t fit their needs and to find the ones that did. Shoppers have increasingly turned to buying furniture online for the wealth of products available and the convenience it affords. The downside is that the amount of options available can be overwhelming and soon your index finger is sore from clicking and your eyes are glazed over, making it impossible to tell one leather sectional from another. The new site features clean style and several “Shop by” filters. Shop by Color will show only blue leather chairs for example or Shop by Style will show only modern sofas. The furniture has also been categorized by price point so you can make sure to stay within your budget. The products within the pricing categories can be arranged either alphabetically if you are looking for a certain brand or model, or from low to high price. The Shop by Size option makes it possible to see only the sofas, sectionals or chairs that will fit in the space you have in mind. Sleeper sofas are categorized by mattress size as well. Features such as cup holders, drop down tables, storage space, and massage chairs have also been categorized. If you’re looking for a specific brand of furniture to match existing furnishings, the most popular brands have been categorized by brand and product. Shoppers can also sort through a preferred category of items that have customer reviews. Additional images for products have also been added. Traditionally, there has been a shot of the furniture piece at a few different angles. The new site contains additional views, as well as the furniture in room scenes or lifestyle scenes. These additional photos help shoppers gain a little perspective on styles that might work best with their decor as well as how the item fits into a room. 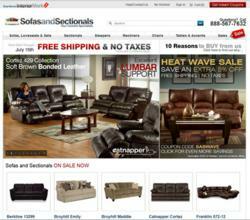 SofasAndSectionals.com has made their site increasingly functional and inviting to use. The fresh, clean look of the site as well as the added features makes finding specific products at SofasAndSectionals.com a breeze. The additional photos help shoppers more clearly visualize how furniture might fit into their homes or enhance existing furnishings. Shopping online for living room furniture and accessories has never been easier. About SofasAndSectionals.com ̶ SofasAndSectionals.com is part of the InteriorMark family of websites. They feature a wide selection of seating groups from some of the finest names in the business. InteriorMark is an industry leader in ecommerce furniture and accessory sales. Their site features over 10,000 products across seven sites that range from opulent high end selections to value priced, casual furniture. 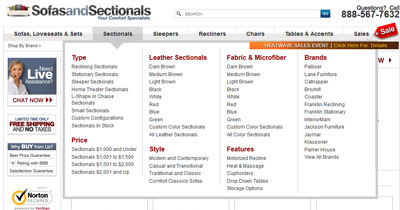 Customers can browse for sectionals by type, style, size, upholstery type or color. The interactive menu makes this an easy task. Shoppers can dial down to specific traits in the furniture that they want. 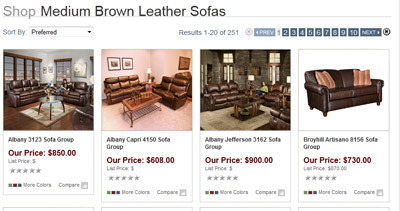 In this example we are looking at medium brown leather sofas. Sofas And Sectionals carries a huge selection of high quality living room furniture like the Broyhill Veronica sectional shown here.